This project, approaching completion, has come out from my spare time in about five years. It implements a boy's dream that has been lurking since my childhood when I watched street organs in the Netherlands. 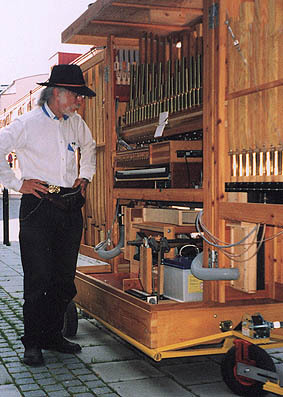 This organ is not supposed to be a replica of any existing model, it is one of free invention, but more than once I have had to retreat to old proven solutions. The only rigidly fixed design parameter is the size of the cabinet, W82*L162*H195 cm (W2'8*L5'4*H6'5) to be compatible with modern doors and elevators here. It has wheels inside its bottom support frame and a general layout of a triptych. Both the central part and the doors are built as frames that are open both rear and forward, but the sides are covered with panels. The side panels of the central part can easily be taken away for access. The left door holds a sparse octave of bass pipes and the right one holds a chromatic octave of accompaniment pipes. The central rack has a 3*25 counter melody and a 4*30 melody chest. The chests actually hold 3*26 and 4*32, giving a few spare positions, maybe useful in case of technical breakdown of some note. Playing indoors in a large room gives an average 95 dB sound level, indeed about the same as blowing a single pipe in the workshop. 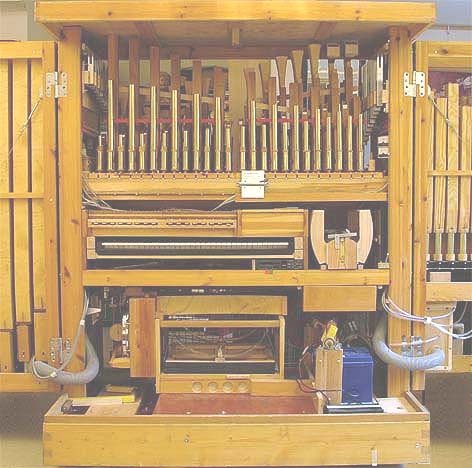 It is obvious how the spatial spreading of the various pipes keeps the level down close to the organ, but increases the listening distance range. Now it is operable in the street, with bellows powered from a lead battery. 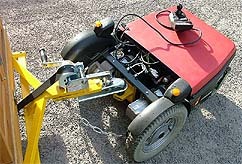 Its 350 kg can be winch loaded and moved with a hand trolley on reasonably flat grounds. AB Permobil has sponsored the project with an electric wheelchair chassis that I have modified into a tractor, easing uphill moving significantly. The sound generating part is the four chests of pipes plus a percussive harp and a drum machine. Each pipe rank is enabled under control of pneumatic signals from a register unit. This unit is a 15 bit electro-pneumatic memory that can also be manually set up. Playing is electrically controlled from an Octet MIDI decoder. This provides 128 output lines on its single channel, controlling all note valves throughout, including setting valves on the register unit. The valve magnets are connected via a patchboard which defines the assignment of MIDI codes to notes and controls. The blowing air is delivered either by feeder bellows located in the bottom frame of the cabinet, or by a remote fan. This air is fed into a reservoir where pressure is regulated to be about 3 kPa (12" water column). After internal distribution, close to each chest, there is an individual regulator to hold chest pressure close to 2 kPa (8" WC), independent of momentary air consumption rate. The MIDI controls can be taken from any convenient source. For free standing use I use a Viscount RD70-II that plays back files from 3.5" diskettes. Detail description Background theory. Articles on technical issues of this project in Mechanical Music Digest. 'Pushing and bouncing air', about air supply, with focus on transient loads. 'Organ pressure regulator and tremulant' design of the pressure regulators and the means to produce a tremulated sound by varying the pressure. Pipes 'Recipe for Wooden Organ Flue Pipes', with designers formulæ, spreadsheet and measurements. 'Pipe cut-up and flue dimensioning chart'. The Ising intonation number for the balancing of dimensions against blowing pressure when voicing a pipe. 'Design dimensions for a reed pipe tongue', expected size, given frequency and pressure.